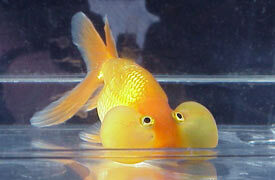 The bubble eye is comparatively rare in UK. 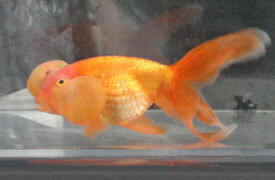 It is a dorsal-less fish, and good specimens will have a clean back and eye bubbles well matched for colour and size. 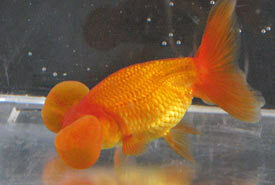 The bubbles are fragile and the fish should be kept separately from boisterous types and away from sharp tank decor, although the bubbles will regrow if punctured. 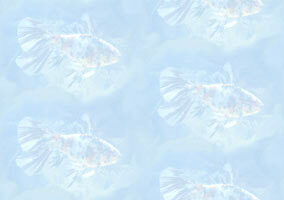 Given proper accommodation, the bubbles do not disadvantage the fish and they become very tame. In the Far East, bubble eyes with the combination of small bubbles and celestial type eyes are known as frogheads or toadheads. 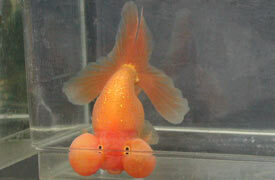 There is also a type with double bubbles, one just under the eye on each side (like the traditional, single bubbles) and one just below and to the rear of the mouth on each side. Eye sacs under and around sides of each eye. The fish should be bright, alert. The body should be medium length with smooth contours and no sign of a dorsal fin. The caudal fin should be well divided, forked and held above the horizontal. The eye sacs should be well developed and evenly matched. Notice that all the fish illustrated on these two pages have nicely balanced eye sacs, matching each other in size and shape. 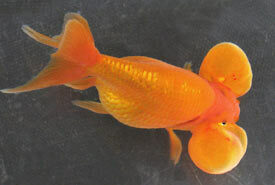 It is fairly common to see fish with one eye sac larger than the other; this does not affect the fish at all, but makes it appear unbalanced. Red, black and calico fish. Note the range of tail types, from the thin-lobed, deeply forked (typical Far Eastern) in the red fish on the left edge of the picture, to the shallow-forked, full tail in the red fish in roughly the equivalent position on the right. Photographed in Hong Kong, December 2003. 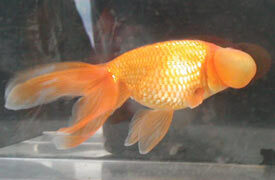 On the left is a mature adult, self-coloured yellow metallic fish, close to the standard, but with rather long tail lobes, although it is nicely self-coloured, lemon yellow being unusual in this type. It was shown at BAS 1999. 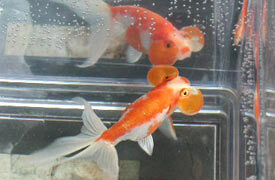 On the right is a young adult, variegated red-orange/silver-white fish with the long finnage and slender body of a Far Eastern lineage; its eye bubbles could ideally be slightly larger but they are well matched in size. It was shown at BAS 2000. 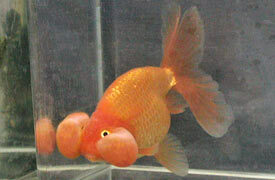 Red metallic bubble eye shown at BAS 2008, more conformant to the standard in that it has shorter finnage. Red bubble eye shown at BAS 2003, with long tail lobes and a somewhat slender body. 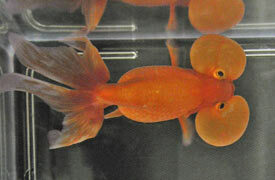 Red bubble eye shown at BAS 2005, with shorter tail lobes and a deeper body. Red bubble eye shown at GSGB 2005, with large, well balanced eye bubbles.